Abstract - Orthogonal Frequency Division Multiplexing (OFDM) technique was proved as an effective solution for mitigating chromatic dispersion (CD) and polarization-mode dispersion (PMD) effects in long haul optical communication systems. However, the large peak-to-average power ratio (PAPR) problem increases the presence of nonlinear effects, which are proportional to the instantaneous signal power. In this paper, we study selected mapping (SLM) and partial transmit sequence (PTS) technique to reduce peak-to-average power ratio. It is also known as a kind of scrambling technique. They are considered as two better methods because of their distortionless characteristics. The simulation results are also presented in this paper. Abstract - This study is concerned with the developing criteria for learning the semantics of UML models in an intelligent tutorial system. This is achieved by going through literature and studying the current approaches for checking the semantics of UML diagrams. This paper concerns with the ability of learning the semantics of UML models using formal methods, For this reason this research enhance an existing system for grading UML models called MUML. The result of this work is an enhanced environment for teaching and checking UML behavior using the means of formal methods. Evaluation results on diagram-based learning do its expectations compared to the traditional learning techniques of the students’ assignments. Abstract - In Mobile Ad Hoc Networks (MANET), the network congestion can rigorously depreciate the network throughput. Also the network congestion results in the packet losses, bandwidth degradation and energy expenditure. Hence a load balancing scheme is required to prevent the network from congestion and exhaustion of resources of congested node. In this paper, we propose a congestion adaptive multi-path routing protocol for load balancing in MANET. When the source node wants to forward the data packet to the destination, it utilizes the reactive route discovery technique where the multiple paths are established using multi-path Dijkstra algorithm. In the discovered route, when any node detects congestion, it intimates the source with congestion notice message. The source node upon receiving the message distributes the data packets through the multiple paths available in its route cache using random transmission technique. If the source does not find any routes in its route cache, then it re-establishes multiple paths and distributes the traffic. By simulation results, we show that the proposed approach alleviates the network congestion. Abstract - The global insurance industry provides investment and supportive insurance services such as: motor/vehicle, fire, home, personal accident, product liability, public liability and professional indemnity. These services are very beneficial to private individuals and companies and critically depend on the actual factors and risks involved in the insurance policy. There are risks involved in taking up or embarking on insurance policies. To analyse all the factors involved in providing insurance to individual or companies is a difficult and time consuming job. Through a design-based research approach, this paper therefore proposes an Underwriting Expert System Advisor (UESA) that allows a less experienced individual judge a particular insurance policy before endorsement. The proposed UESA helps an individual calculate all factors and risks involved in taking on a particular insurance policy and advices which policy is best to be chosen in accordance to the individual’s interests and finance ability. From an insurance perspective of Ghana, the UESA in the paper examines three insurance policies, namely: i) Motor Vehicle Insurance, ii) Personal Accident Insurance, and iii) Travel Insurance. The knowledge-base collected for the UESA proposed in this paper consists of a collection of knowledge from insurance underwriting experts and a website and constitutes a 16 Rule-Based procedure/strategy. Abstract - This paper compares the performances of DWDM system with 04 channels and 10Gb/s per channel with a channel spacing of 50 GHz using a conventional single mode fibre (SMF) or non zero dispersion shifted fiber (NZDSF). NZDSF concern three types of fibers: TeraLight fiber, TrueWave fiber and Corning fiber. For this, a simulation of DWDM system is performed using OptSim software. Chromatic dispersion compensation and non linear phenomenon in the fiber (SPM, XPM Raman SRS) are also included in the simulation. The performances in terms of EYE DIAGRAM and BER are presented to illustrate the limitation transmission for each type of fiber. Abstract - In WSN, Nodes in the network act as routers and forward messages on behalf of the other nodes. This paper presents a comprehensive simulation study of well know On-demand routing protocols Ad hoc On demand Distance Vector (AODV), Table-driven routing protocol Destination Sequenced Distance Vector (DSDV) with the consideration of the node misbehavior. This problem of node misbehavior can be detected and controlled by different techniques such as Multiple Route Set (MRS) discussed in this paper which is more efficient than other general techniques. 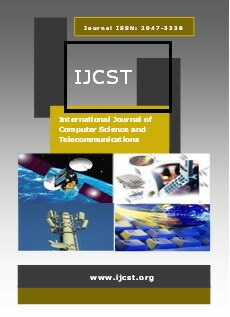 Abstract - Spectrum sensing is a challenging task for cognitive radio. In this paper we analyze collaborative spectrum sensing over Nakagami fading channel in cognitive radio. Through computer simulation, we evaluate the performance of collaborative spectrum sensing and signal detection by employing OR, AND and MAJORITY rules as decision combining. Energy detection is one of the popular spectrums sensing technique for cognitive radio. Energy detector is used to observe the presence of primary user (PU) signal. Simulation results show that expected higher m gives better performance in Nakagami fading channel in Cognitive Radio. It also shows that collaboration improves the probability of detection to detect PUs signal in cognitive radio (CR) system and OR rule is the best among the hard fusion rules. Abstract - Wireless Mesh Networks (WMNs) have emerged as one of the new hot topics in wireless communications. The use of multi-channel multi-radio (MCMR) systems can considerably enhance the throughput capacity of a WMN which requires suitable routing approaches and efficient channel assignment (CA) to the different links in order to minimize the interference and maximize the throughput. Multicast is an efficient mechanism that simultaneously delivers identical data to a group of receivers. Several approaches and mechanisms have been proposed to build multicast trees and to do an efficient CA. Existing multicast routing and CA algorithms suppose that the multicast membership is static, whereas, it is dynamic in practice. In this paper, we aim to make the group membership of a multicast tree dynamic i.e. we allow nodes to join and to leave the multicast tree freely without compromising the effectiveness of the CA. Particularly, we propose two algorithms to make a multicast tree dynamic: Node Joining the Multicast session algorithm (NJM) and Node Disjoining the Multicast session algorithm (NDM). We illustrate the use of these algorithms by examples and we show how they maintain the number of relay nodes minimal in order to maximize the throughput which is the paramount priority in WMNs. Abstract - In recent days there is an enormous growth in the storage of digital medical images in the databases. To access these images Content based image retrieval (CBIR) is used as an alternative to automated text based image retrieval approach. In CBIR the input query is in the form of medical image and retrieves diagnostic cases similar to it. To reduce the storage and transmission requirements of the medical images, Image compression techniques are utilized. In this paper, a method has been proposed which integrates image retrieval and compression techniques to minimize the bandwidth utilization. Loseless image compression is obtained using the Haar wavelet. Sobel edge detector and Gabor transforms have been employed for the extraction of the Edge and texture features from the compressed medical images. The classification is done using the Classification and regression tree (CART) and Instance based learner (IBL) and the accuracy obtained is 88% for the CART and 93% for IBL. Abstract - Cartography is the art and science of making maps. Until the 1960s, maps were made the time-honored, traditional way: Draw an original map by hand, based on land survey measurements and other information. Print as many copies as you need. That change with the advent of computers, satellite imagery, and Global Positioning System (GPS), made making maps much easier. Most paper maps now are generated or produced on a computer. Now a day, GPS become one of the important tools of map data collection. It preserves time, reduces cost, provides reliable accuracy, digital data transferring and manipulation, more over data can be collected at any time. Survey GPS receiver provides high accuracy compared with hand-held one. At the same time, the later is the much cheaper and is usually used for navigation purposes. This research work is oriented to practically evaluate the field horizontal accuracy that can be obtained using the hand held GPS receiver. Results obtained, showed that the hand held GPS receiver can practically provides horizontal accuracy of about 4m. This result leads to the suitability of using it for collecting data to produce planimetric maps at scale 1:7,500 and smaller. Abstract - In real-time systems, a task needs to be performed correctly and timely. The correctness of each computation depends on both the logical results of the computation and the time at which results are produced. So “time” is most important in real-time application systems. Multicore and multithreaded CPUs becomes the new approach in real time system to achieve system performance, power efficiency, and software concerns in relation to application and workload characteristics. Multiprocessor Real time system requires an efficient algorithm to determine when and on which processor a given task should execute. The proposed work presents a comparative study of different customized Multiprocessor scheduling algorithms which maximizes system performance and decides the real time tasks that can be processed without violating timing constraints. A major advantage of the simulation is that it provides a fast and easy way to evaluate the system performance in Real-time system and consider tasks priorities which cause higher system utilization and lowers deadline miss time. To overcome the run-time scheduling and the prioritized-partitioned problems, accomplish a multiprocessor system on chip simulator which is capable of accurately simulating a variety of processor, memory, multiprocessor system on chip configurations and evaluate their effect on real-time system to improve the system performance with the help of different algorithms i.e. FPZL (Fixed Priority until Zero Laxity) & DPZL (Dynamic Priority until Zero Laxity).